Drawn from the Alkazi Collection of Photography, this exhibition catalogue explores the arrival, dissemination and advancement of studio photography in Mumbai, through both European and “native” cameramen. A keen recording of castes and tribes by British officials, in time, gradually expanded to the experimentation with portraiture and performance in numerous photo studios such as S. Hormusjee and Shapoor N. Bhewar, among others. 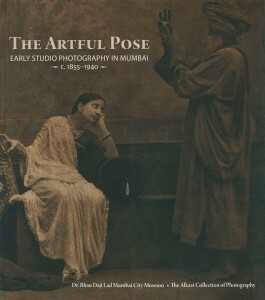 By the late 19th Century, professionals and independent firms, such as Bourne & Shepherd and Lala Deen Dayal & Sons, enlarged the ambit of photography’s influence, with enduring images of families, events and landscapes, beautifully illustrated in official and personal souvenir albums, carte-de-visite portraits and even panoramic views of Mumbai city, a rising industrial metropolis at the time. Remnants of the past studio exist even today, bearing insights into the role of conventional art-practices in popular culture. The supporting essays in this publication highlight important photographers and trends in the early years of photography in India, thereby deepening our understanding of a bygone era of image-making in the wake of the digital age. This is perhaps what makes early photography a rich and vital part of Indian art and culture today, ever since its invention almost 170 years ago. Rahaab Allana is Curator of the Alkazi Foundation for the Arts in New Delhi. He is a graduate in Art History (M.A.) from School of Oriental and African Studies, London. Partha Mitter is Hon. D.Lit (Courtauld Institute, London), Emeritus Professor, University of Sussex and member of Wolfson College, Oxford. Akshaya Tankha is Research Scholar at Alkazi Foundation for the Arts, and Curatorial Assistant for the exhibition, ‘The Artful Pose’. Suryanandini Sinha is Ph.D. candidate at School of Arts and Aesthetics, Jawaharlal Nehru University, New Delhi researching “The Intercepted Photograph: Interactions of Painting and Digital Media with Studio Photography in India”. With a foreword by Tasneem Zakaria Mehta, Managing Trustee, Dr Bhau Daji Lad Mumbai City Museum.